Around 50 firefighters tackled a blaze at a retirement complex in Huntingdon last night. All the residents at the site in Cromwell Walk were evacuated, but there were no reports of any casualties. Firefighters had the fire put out late last night. No details of how the fire started have yet been revealed. 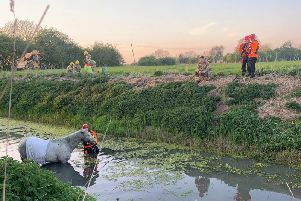 Cambridgeshire police assisted the firefighters. A section of the ring road was closed.